We'd like to remind visitors to this beautiful nature reserve must park in the village car park (off the High Street). There is no car parking at the reserve itself. Thank you. The clays of Feckenham Wylde Moor support a surface layer of fen peat, an uncommon Worcestershire habitat that gives the pools their dark velvety hue. The land here was drained in 1850 for agriculture but the drainage system became blocked in more recent times and the restoration of the wetland has begun. The Trust has excavated a large pool along with several smaller scrapes for dragonflies and other wildlife. As well as a circular trail that covers most of the reserve, visitors can enjoy the views from two hides. Little grebes, kingfishers, frogs, toads, swans and an amazing array of dragonflies and damselflies are regularly seen here. Seventeen species of the latter have been recorded here including large red-eye damselflies, hawkers, chasers and emperor dragonflies. The wet grasslands have a rough hay crop removed in late summer and are then grazed by cattle for several months. This ensures that nutrients are removed that would otherwise build up and reduce the extent and number of plants and associated wildlife which require these impoverished conditions. The moist conditions allow ragged robin, common spotted orchid, cowslip and lady’s smock to thrive and lucky visitors may spot common snipe exploring the wet meadows. Reed buntings can be spotted among the reed beds and the mixed hedgerows provide food and shelter for other birds and small mammals. Feckenham village was once a significant site on the ancient Saltway between Alcester and Droitwich. It’s listed in the Domesday Book as ‘fecceham’ (Fecca’s Ham is a clearing by a stream or enclosure/homestead) and once stood in the middle of the ancient Royal Forest of Feckenham which covered much of the county. The Forest reduced in size and by the 16th century what was left reverted to common land. 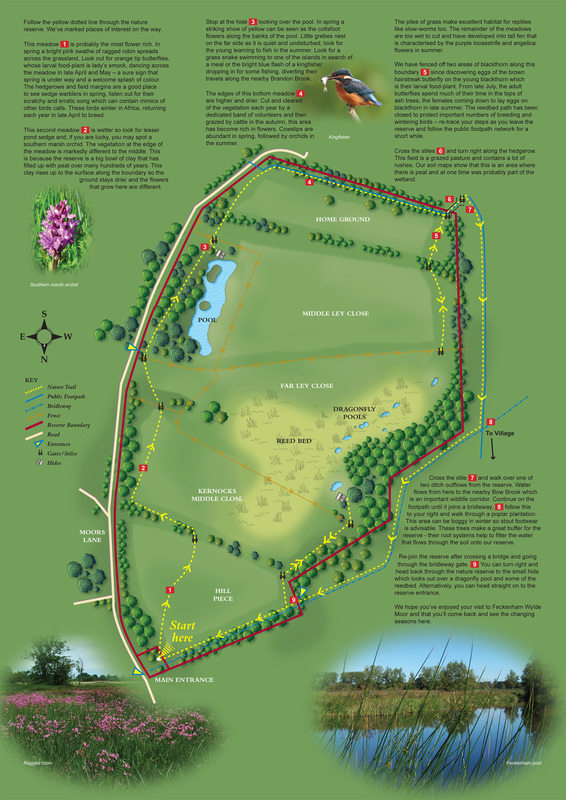 Why is Feckenham Wylde Moor a Flagship Reserve? This site is small with limited access though there is a local community living nearby and we will develop links with this community encouraging them to help with our management and develop an appreciation of the site. Good fen is rare in this part of the country and we will continue to manage to maintain and enhance floristically diverse open fen. Feckenham is a Site of Special Scientific Interest and lies within the larger living landscape of the Forest of Feckenham. Unsuitable for wheelchairs and buggies. Trail is marked on the nature reserve; ground is wet underfoot most of the year. Kissing gates to enter reserve. If the circular trail is followed the route goes out of the reserve over a bridge and stile before rejoining the reserve via a bridge and kissing gate. 2 nature watching hides on the reserve. Park in public car park in Feckenham village and walk up to the reserve along Moors Lane, approx distance 1 mile. There is no parking at the reserve.